Wonderful article! What a brave man. great. watch the story of the marksman on t.v. never believed he was real. Saw a fantastic article on Hathcock today on the History Channel. What a person of honor…. Just read the book – the man is a legend – TRUE AMERICAN SOLDIER! Carlos Hathcock was definitely a modern American hero. 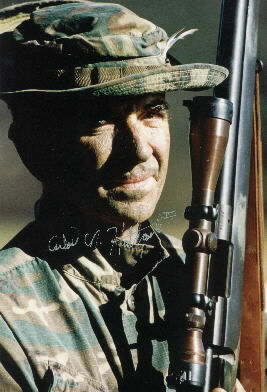 I noticed you have an error on the caption of Carlos posing with his rifle and his bush hat with the white feather, as far as I can tell that is one of his 7.62 x 51 rifles, it is definitely a short action and not a .50 caliber browning as you have it listed. It is more likely a Winchester model 70 or a Remington model 700 / M-40. CARLOS HATHCOCK IS A REAL HERO. HE DIED TOO SOON. MARINE SNIPER IS THE BEST BOOK I’VE EVER READ. The image of GySgt Carlos Hathcock at 1000 yard line in summer of 1978 will always remain. Him teaching the WM team long distance wind reading. Semper Fi Marine. USMC Is The Srong Iron That Sharpened “White Feather Iron” To A Extraordinary Blade Of Steel Never To Be Beaten Broken Or Bullied Into Submission……. curios about this man and what a great man I had to look him up. What a great lesson in this life. I recently talked to a man at my brothers funeral services, my brother was a mia in vietnam from sep-26-1966 until they found his remains in april of 2010, the man I mentioned is Howard A Chambers, he said Hathcock trained him to be a sniper in vietnam. what a Hero Hathcock was, and his legend still lives. This is pretty good… except you forgot 1 detail. Carlos Hathcock was never killed by a bullet. The 1 sniper that could of killed him got shot by Carlos because the sun glinted off the enemies scope. Carlos N. Hathcock was actually killed because he suffered 2nd and 3rd degree burns over 40% of his body. He then died of a disease weeks after pinning a metal on his only childs uniform. The sons name was Carlos Hathcock 3. I went through Hathcock’s Police Sniper School in October 1993 as a member of the Portsmouth Police Tactical Response Unit. I was fortunate enough to obtain a “Signature Target by placing three shots through the same hole. The gunny signed my target and I have it on my trophy wall! I also took Hathcock home during sniper school. I met his wife and he showed me some of his sniper rifles. It was an Honor to attend his Sniper school being that I’m also a Former Marine. 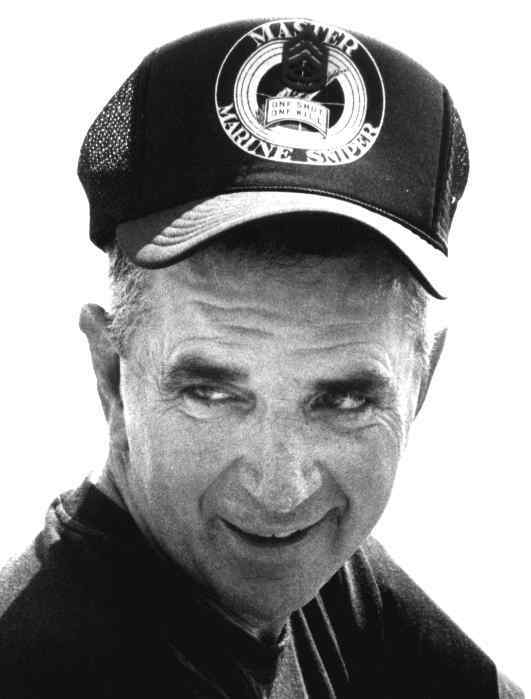 I attended Hatchcocks funeral and he is buried at Woodlawn Cemetary in Virginia Beach Virginia. Semper Fi Carlos! Rest in peace my brother! the only person I wanted too hear and watch back to back,and then look up online. Rest In Peace brave one. May your leagacy live on. I wasn’t a USMC sniper but would have been if I’d had a different December birthday. 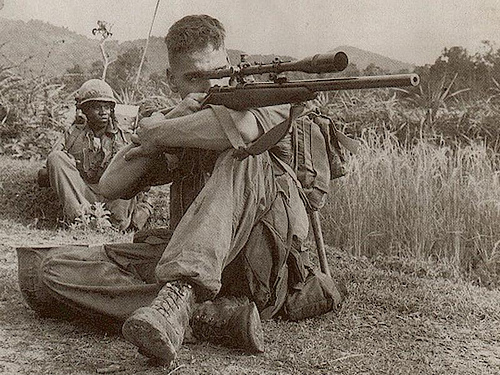 I would have most certainly have followed my older brother into Viet Nam as a recon scout sniper. I Corps, DMZ, Quang Tri, Da Nang, Khe Sanh, Hill 881S, Tet, multiple USMC platoon pictures…with few survivors, super 8 videos of nearby napalm strikes, flashes in the distant sea horizon ..from the battleship NewJersey …firing into another “heart of darkness” in a different continent….all places where my brother fought …yet I held little or no comprehension of the history he was living. Hathcock made it happen when it was necessary. Thank you, Gunny Hathcock for your service. You are gone now …as are two USMC brothers of mine but you not forgotten. Semper fi. I salute you. Your nation salutes you. Just finished reading Silent Warrior. Excellent read. 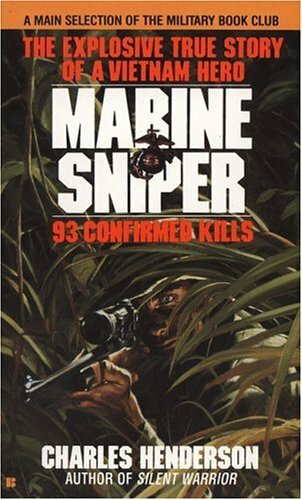 Will read Marine Sniper soon. I myself have never experienced war, but have great respect for those who served in Vietnam. 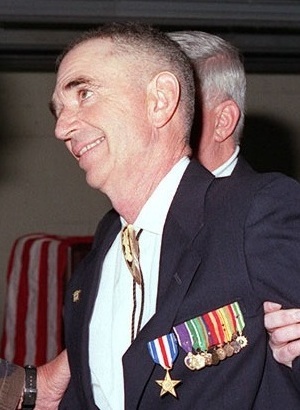 Gunny Hathcock was a true American. If you respect Vietnam vets and admire men like Hathcock, you might want to read a biography I authored titled: An American Knight: The Life of Col. John Ripley. See more at http://www.americanknight.org. This blog is actually dedicated to the memory of Col. Ripley.